Is LottoDay a Scam or Legit? Read 15 Reviews! Extra! Extra! – read all about it. LottoDay was bought by the Ibid Group and rebranded late last year. Their new and improved site offers international lotteries online, new products, casino games, and scratch cards. LottoDay.com has streamlined their site for two languages – English and German! That includes the terms and conditions in both languages. So let’s go take a look at this reboot! Players have ten international lotteries to bet on including the big boys of US Powerball and EuroMillions. Lottoday uses the official results for their prize tiers. Players can choose one line or more to play, plus subscriptions from 2 to 4 draws, offer a 33% discount. Players can opt out of play by simply emailing LottoDay.com giving then 24 hours’ notice and can take seven business days to act. There are three syndicates available – US Powerball, US Mega Millions and Italy’s SuperEnalotto. Each has 50 lines and though there is no information on their site, their support told us that there are 100 shares in each syndicate. Winnings are credited directly to your account though over a certain level (at LottoDay’s discretion), further documentation might be required by the winner. Jackpots must be claimed within 30 days and the rest of the prize tiers within 90 days. There is no information regarding commission but they will deduct any costs related to getting your winnings. Also note that taxes will be deducted where applicable so, besides the US lotteries, EuroMillions is played through Spain who takes 20%. LottoDay also reserves the right to decide whether they pay you out your jackpot through an annuity or lump sum. Oh – where there is one or more winners in the officially published lottery and one or more winners at LottoDay.com, the winnings are divided by the total amount of winners. LottoDay.com will process any withdrawal within 72 hours of you asking for your money. They set a minimum and maximum amount that can be withdrawn – at their sole discretion – but the amount isn’t included in the terms and conditions. They also might require additional identification prior to paying out anything. There is no time frame for the actual transfer of your winnings. Keep in mind that any jackpot paid will be coming from an insurer so there could be delays. Who Can Play at LottoDay.com? According to LottoDay.com, because this is betting on the results and not actually purchasing tickets anyone can play here (FAQ) – except if you live in the United States! It also applies to any country where it is illegal to play. Oh, and you must be ‘of legal age’ and ‘sound mind’. 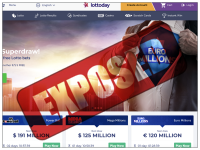 LottoDay has expanded its platform to include a casino and scratch games. LottoDay’s casino has table games, video slots, and video poker. The scratch games have prizes from €500 up to €100,000. LottoDay.com though registered in the Isle of Man is operated by Betpoint Group Ltd. registered with a head office in Malta. There is an Isle of Man snail mail and email address for customer support. There sort of is live chat – type in a message into the support form and they do pop you back – just not sure when someone is there as it can take a while. I’m still struggling a bit over the terms and conditions and general lack of information regarding getting your winnings. I also have a problem in the concept of annuity versus lump sum and the fact that LottoDay.com gets to choose. This site doesn’t get a thumbs up or down. There does seem to be some work needed in their terms and conditions plus I still don’t like their share ratio in their syndicates. If you have played here since the November 2018 reboot, we’d love to hear from you. LottoDay sends/lets send me about 50 spam-mails per day although I never gave them any data, although I never authorised anybody to send me spam für LottoDay. The unsubscribe-link does – of course – not work. I do not think that it is reasonable to give such a company even one Penny. I am reading the comments here and I wished I saw them before. Anyway, I can only be happy with their service. I just got my withdrawal request approved. Looking forward to play with them again. Lottoday is as far as I’m concerned a complete scam. I have been trying to cancel a multi purchase which they say to just contact them at their support email and they will do this…but no, they don’t. And they don’t respond at all, and they kept debiting my credit card – they are a fraud and arrests and prosecution are needed. DO NOT SUBSCRIBE to LOTTODAY…IT’S A TOTAL FRAUD. Terrible. Cannot trust them after they illegally took money from my card and won’t pay it back. FRAUDSTERS and they should be forced to close down. I have contacted Action Fraud about them. Steven Johnson, John Baxter… all sound like made up names to me! Steven, if you’re reading this – you responded to my previous message saying that you would be happy to compensate me. Well to be honest; I have already started legal proceedings and LottoDay (Feelings Ltd) will be notified from my Lawyer shortly. Why don’t you just admit that LottoDay is a scam? You and your shoddy business is laughable. I’d love to see you prove your Staff are really who they say they are; by providing me with a scan of their passports. That will never happen will it? Thought as much. You have my details. You can compensate me with $5,000. Yup. I’m pretty sure this site is a scam. I bought only 1 lottery ticket for $5 using my credit card as my payment, and couple minutes later, somebody called me and said i won over $50K of money, and explain about the VIP stuff. I DID NOT AGREE to join that, I just said i will think about it, and after that phone call, suddenly my credit card has been charged $397.8. Hey i was playing last year as a VIP member and i was really happy with the service, too bad they choose different people every year.. I also was playing last year and does not get my money. I won 4044 € and lottoday.com does not give me my money. We apologize that you were not fully satisfied with the information provided on our website. If you wish, you can speak with one of our account managers, he can give you a more detailed information of our offers and about us as a company. We kindly ask you to either contact us at support @lottoday.com, or give us a call at +44 808 164 1527 if you would like to speak to us. Can you please tell me your Lottoday account or your email address i am pretty sure i have never spoken with you? Similar to an experience before. Signed up for a ticket via an incentive on an app I use then got a call relating to VIP from a Daniel Pieters. Was told it was a raffle I’d won and I said I wouldn’t give any financial info’ out, which he said he was fine with and I only had to login separately to see the $300 AUD credited. Wow, I thought, actually won till my bank statement showed it was actually my money! Tried to withdraw remaining money and no luck several months on despite several emails with excuses and even a chance phone call from Manager asking how I was enjoying VIP! SCAM AVOID. I will now have to pursue with high authorities and will feed back any significant updates. WARNING: LottoDay.com is a SCAM. I signed up only 3 days ago and today I received constant phone calls from someone claiming to work for the company. He said his name was “John Baxter” and even confirmed my contact details. What’s more – he number that called me is the exact same number that is displayed on LottoDay.com and he emailed me which also came from the same domain. this email is a follow up on our brief but very pleasant conversation from yesterday. I believe I managed to get a good idea of what your current situation is; therefore, I wish to present you with what I do with my clients, which could be beneficial for both parties. The Delek Group, the owner of Phoenix Online Holdings, is one of Israel’s dominant integrated energy companies, it is also the pioneering leader of the natural gas exploration and production activities that are transforming the Eastern Mediterranean’s Levant Basin into one of the energy industry’s most promising emerging regions. Phoenix Holdings Ltd., integrates the operations of Phoenix Insurance Company Ltd. – one of Israel’s leading Insurance companies that provides Non-Life, Health Insurance and Long-Term Savings, as well as the Phoenix Investments and Finance Ltd.
Phoenix Holdings has approximately NIS 50 billion of assets (including Excellence) and is one of Israel’s largest financial groups. The company benefits from stability due to its diversified holdings structure and from its intelligent management of capital. I want you to think about the idea I presented you with during our call. We will take calculated risks in order for us to benefit and build funding. I do believe that you are a person who can relate to a solid business opportunity of such sort. Do not hesitate to get in touch with me in case any questions come up. Looking forward to hearing from you. where the VIPS keep in touch. Also the phone is important as I am going to be the one to update you and send you checks and transfers so please save both and either call me or send me and e-mail to tell me how we proceed. I find LottoDay.com untrustworthy and shall be contacting my local police station about this. Note: I signed up using my credit card and fear that the crooks behind LottoDay will be taking money from my card without my consent. There is no option for me to remove the card from my account either. We apologize that you have had a bad experience with LottoDay. The person you were contacted with, John Baxter, is one of our most senior employees. The reason he had your contact details is because you opened an account on our website, and left your name, number and e-mail. I can assure you that your details are protected by the most advanced security measures to ensure your safety. Please let us know if we can do anything for you, we would be happy to speak to you, and if you wish, compensate you for any inconveniences we might have caused. You can either contact us at support @lottoday.com, or give us a call at +44 808 164 1572. Lottoday took money from my card 200 euros and I don’t know what to do now. I have sent them an email, but there is no response. Can you please help me?! We would firstly like to apologize for any inconvenience this might have caused. We have tried to locate your account with us to contact you and help you resolve this matter as soon as possible. Unfortunately, based on the information you published it was not possible to get a hold of you. Therefore, we kindly ask you to contact us either at VIP @lottoday.com / support @lottoday.com or by calling us at +44 808 164 1527. Its a scam website price on tickets more than doubled as of the natural price. They contacted me by phone and insisted me on buying a monthly subscription and lied about its price. I tried to cancel that and it never happened, even after they told me it’s cancelled. We apologize for any inconveniences we have caused on your part. You requested to cancel your subscription on the 9th October 2016, and it was cancelled on the 13th October, 4 days later. We were fully unaware that this made you feel bad and ruined your experience with LottoDay. We kindly ask you to either contact us at support @lottoday.com, or give us a call at +44 808 164 1527. We would be more than happy to compensate you for your inconvenience. We are looking forward to getting in touch with you soon! I got an email promotion from Lottoday and decided to try my luck. I bought 5 tickets and actually won 25$. They contacted me and notified me for my win. Thank you for your positive comment. We are more than glad to hear that you had a satisfying experience with us, as we put the satisfaction of our clients at top priority. Please let us know if there is anything else we can do for you to improve your experience. You can either contact us at support @lottoday.com, or give us a call at +44 808 164 1527. I started to think this is an average site and then as they recommended I delved into the small print. Their syndicate information is pretty light on and share ratio not attractive. The fact that I’d have to go and personally get any win over $600 definitely good. I also pay my utilities through a landlord so couldn’t get that document to get my money. Would I still be able to get my winnings?